Let someone know you are thinking of them with this delicate Sympathy card. 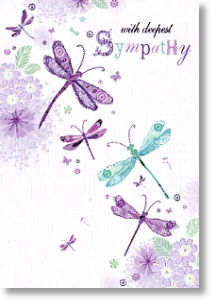 The card has a collage/embroidery style design, showing dragonflies and flowers in purple and green tones. The card itself is textured like fabric and has purple foil writing and detail.